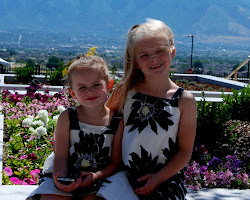 Last Friday night, Grandma and Grandpa took me and Kat, oh and the kids to Hogle Zoo. They really do it up right for Christmas. I loved getting to walk through so many well down lights. I did NOT love the cold. It took a while to get into the zoo, and the crowd was massive. Let's just say we had to park on the street. That may give you an idea of how many people there were. We weren't even terribly late getting there. 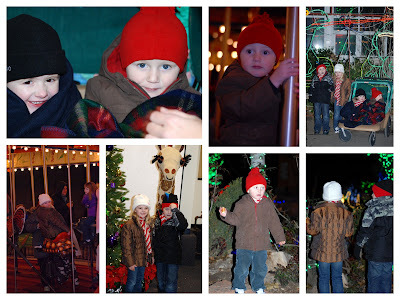 The kids loved the lights, and had fun doing the "Members Only" craft of creating a bookmark. They will make the most out of any craft they can do. Sick little Ivy even got out of the stroller to do the craft. 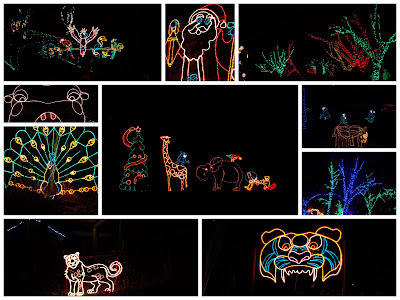 Here is a collage of the lights. Pretty cool, huh? Here is another collage . (I love the collages you can do with Picasa 3). As you can tell by Ivy's eyes, she was in the middle of a fever episode. You won't catch us missing out on the fun due to a little old fever! Thanks Grandpa and Grandma for upgrading to a booster, getting us all in free and buying tickets for the merry-go-round. The kids (and the moms) want to do it again next year. We'll just bundle up better and not go on a Friday night. I'm so glad you blog so well...so I can steal your awesome pictures! None of my four that I took before the battery died really looked good. I'm glad I'm not the only fan of Picasa 3. You do a great job with the pictures and collages.